Plenty of eyebrows were raised in NBA circles when Cody Zeller announced his intentions to forgo being a top-10 pick in the 2012 Draft and return to Indiana for his sophomore season. It turns out many of those concerns were justified, as Zeller struggled to make significant progress off his fantastic freshman campaign and evolve into the dominating presence he was expected to develop into as a sophomore. Zeller's scoring rate (21.8 points per-40 minutes pace adjusted) remained nearly identical to where it was last year, while his efficiency dropped somewhat and his turnover rate increased. To his credit, his rebounding rate did improve by about 20%, which is one of the biggest concerns NBA scouts expressed about him following his freshman year. With that said, many scouts were hoping to see him add some new wrinkles to his game as a sophomore and show more assertiveness in establishing himself offensively as a go-to guy at the college level, something he struggled to do in many of Indiana's biggest games this season, particularly down the stretch in the Big 10 and NCAA Tournaments. The intrigue around Zeller continues to revolve around his excellent combination of size, athleticism and scoring instincts. A fluid, coordinated 7-footer, Zeller runs the floor as well as any big man in college basketball and can make plays above the rim with ease if given a running start. Zeller sports a near-complete offensive game, as he's capable of scoring in virtually every way possible from almost anywhere on the floor and gets to the free throw line nearly ten times per-40, an unbelievable rate. He's a very dangerous weapon in particular in the low-post, capable of slithering his way around defenders with quick spin-moves and excellent body control, and turning to either shoulder with very soft touch. A very good ball-handler for his size, he's also adept at beating defenders off the dribble with an excellent first step going left or right, and then finishing with either hand in a variety of creative ways, sometimes using the glass. From the perimeter, Zeller didn't make a great deal of progress on paper with his jump-shot this season, as he only attempted 24 jumpers in 36 games according to Synergy Sports Technology, as opposed to eight total last season. Even when open, he doesn't always look entirely comfortable shooting from distance. With that said, it's difficult not to feel like he has much better potential here than he was able to show playing the center position full-time for Indiana, as he shows solid shooting mechanics and touch when he did step away from the basket, and makes his free throws at a high rate (75.5%) as well. In the more wide-open style of play that's found in the NBA, probably seeing more time at the power forward position, it's likely that this will become a much bigger part of his game in time. He also shows good potential as a pick and roll finisher, as he has quick feet stepping out to the perimeter, good timing on his rolls, excellent hands, and the ability to finish with either hand and with soft touch. This is another area of his game that will likely increase in importance alongside more talented ball-handling guards than he had at Indiana, and with better spacing thanks to the NBA 3-point line. Zeller also runs the floor tremendously well, as mentioned. He gets out ahead of the defense a couple of times every game, more frequently than any big man in this draft (scroll to Gazeller Watch), and then finishes 80% of his field goal attempts in transition once there. Despite the high skill-level and tremendous versatility Zeller displays, his offensive game is not a cinch to translate seamlessly to the NBA, unless he makes some stark improvement in certain areas. For one, Zeller didn't add all that much weight to his frame between his freshman and sophomore seasons, or at least he didn't maintain the bulk he did put on, as he still gets pushed around quite a bit inside by more physical opponents. Does he have the lower body strength needed to establish position inside the paint and score in the low-post the way he did in college? Opposing teams seemingly recognized that he doesn't love contact and tried to rough him up quite a bit as the year moved on, which he didn't really respond to in the best way, especially in Indiana's biggest games. His short wingspan and seemingly small hands appeared to be a major factor when looking at his ability to finish over length at the collegiate level, as he has a low release point on many of his shots around the rim, and gets his shot blocked a lot more than you'd hope. With his frail frame, average explosiveness off two feet, and short arms, there are plenty of concerns about whether he'll be able to finish consistently in traffic at the NBA level. Many of the same concerns apply when attempting to evaluate what type of rebounder and defender he might be in the NBA as well. His short wingspan, underdeveloped frame and average toughness could make it difficult for him to be a major factor on the glass or as a weakside presence, as he struggles to stop more physical opponents from posting him up inside, and was not a prolific rebounder or shot-blocker at the college level. As a power forward, there are some question marks about whether he has the ability to consistently stay in front of more perimeter oriented players, as he isn't overly physical putting a body on opponents or containing penetration, and thus got scored on a fair amount at the college level in one on one situations. 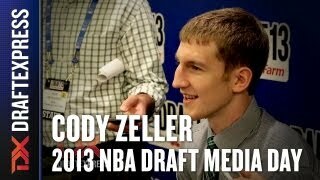 To his credit, Zeller is a very intelligent player who plays with good effort and awareness. His quick feet and excellent agility and coordination give him terrific potential as a pick and roll defender, as he does a very good job of hedging out to the perimeter and recovering. As he matures and his body fills out over the next few years, he'll almost certainly look drastically different from a physical standpoint and also have a much better idea for how to adjust for his shortcomings. By all accounts he's a very coachable player with a solid work ethic, so it's unlikely that he's finished developing considering he's still only 20 years. Zeller's stock took a bit of a hit this season, to the point that he is no longer a lock to get drafted in the top five as he was projected to start the year. He'll need to have a good showing during the pre-draft process, particularly in matchups with other players at his position, but it's difficult to see him falling too far in the draft considering he's an athletic 7-footer with tremendous scoring instincts. Barring injury, it's safe to say Zeller will be in the NBA for a long time. While many highly touted freshmen have struggled somewhat making the considerable transition from the high school to college level early on, Indiana's Cody Zeller clearly has had no such issues, already establishing himself as one of the most productive players in America thus far. The sample sizes still leave a lot to be desired just eight games in, and probably shouldn't be read into too much considering the competition level, but the fact that he ranks second amongst all freshmen in per-minute scoring, second in true shooting percentage, first in PER, fifth in rebounding, first in steals and third in blocks shows just how much of a factor he's been for his team in the early going. Beyond the numbers, Zeller draws significant intrigue with the outstanding combination of mobility, scoring instincts and aggressiveness he displays, all of which hint at a terrific future which could be in store for him as he continues to develop. Zeller possesses short arms and a very skinny frame at the moment, which could be the main thing holding him back long term, but he's an incredibly agile and fluid big man who runs the floor well and has the explosiveness to play above the rim on a regular basis. Most of his touches come inside the paint at the moment, where he looks incredibly comfortable operating with his back to the basket thanks to his nimble footwork and smooth post moves. He uses head-fakes, shot-fakes and spin moves well, showing a more advanced arsenal of counters than you'd expect considering his age. Despite his skinny frame, Zeller is not afraid to bang with older players inside, looking very hungry calling for the ball on the block and usually attempting to finish strong with a dunk once at the rim. Toughness does not appear to be an issue here, as we've seen at times with his siblings. Zeller's aggressiveness has paid off early on in the season, as he's finishing 68% of his 2-point attempts and getting to the free throw line at a strong rate, where he converts an excellent 75%. Zeller hasn't shown much in the ways of a jump-shot thus farsomething he'll likely need to develop down the road--but he does appear to have above average ball-handling skills for a player his size. He can put the ball down and attack his matchup from the perimeter, and looks comfortable handling in transition. He's turned the ball over at an impressively low rate this season considering his go-to role and youth, but also hasn't racked up many assists. Defensively, Zeller has distinct strengths and weaknesses. On one hand, he clearly possesses outstanding instincts and anticipation skills, allowing him to be extremely productive both in the passing lanes and as a shot-blocker. He currently ranks 3rd amongst all prospects in steals on a per-minute basis, doing a good job poking the ball away from his opponent from behind when defending the post, and also showing nice timing rejecting shots on the ball without leaving his feet. On the other hand, Zeller's poor wingspan and lack of strength is a definite disadvantage, as he's prone to being backed down in the paint, and tends to give up deep post position too easily inside. He hasn't really faced anything resembling a NBA caliber big man prospect at this stage of the season yet, so it will be interesting to see how he fares against stronger, more mature players on both ends of the floor. Zeller's play early on leaves plenty of room for optimism, both for NBA scouts interested in finding skilled, athletic big men capable of scoring inside the paint, and for Indiana fans eager for a NCAA tournament berth after a four year drought. How he fares in tests matching up with the frontcourts of Kentucky (this Saturday), Ohio State and to a lesser extent Illinois will likely shed plenty of insight into how quickly he might be ready to make his next big jump in competition. The younger brother of former Notre Dame forward Luke Zeller and North Carolina star Tyler Zeller, Cody Zeller (#17 Scout, #20 Rivals, #12 ESPN) shares some of his brothers' attributes, but didn't do much to distinguish himself from the pack over the course of the week. Possessing good height, but a narrow, skinny frame, Zeller played hard and smart, but struggled to finish against the stronger, more athletic, and more aggressive players he was regularly matched up with inside the paint. He has good touch with both hands, and can step out and shoot the ball from the perimeter, but will need to gain weight and refine the same jump hook shot his brother did to help him establish position down low and score over defenders. Though Cody is not as athletic as his brother Tyler, he should see plenty of playing time to develop his game as Tom Crean rebuilds the Indiana program. He'll be joined by a very talented group of recruits next season, and if he can continue to add toughness and improve his rebounding and defensive skills, should be a factor in the Big Ten sometime down the road.